Paintings by Sir John Lavery, Jack B Yeats, Sir William Orpen and Walter Frederick Osborne that have been on loan to Dublin’s Hugh Lane Gallery and Limerick’s Hunt Museum have been shipped to London for an Irish Art Sale at Sotheby’s. 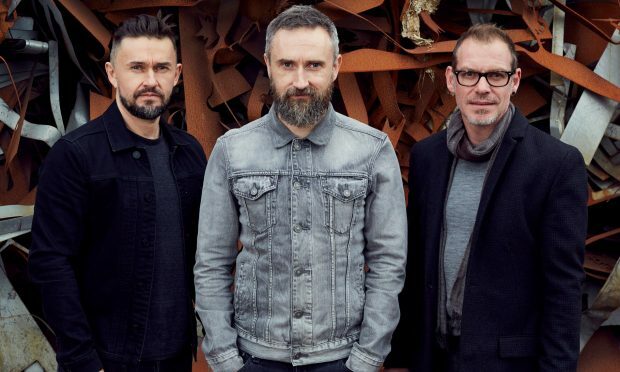 The paintings are owned by a family who acquired them in the late 1990s in London at the height of the Celtic Tiger Irish art boom who then loaned the paintings to the galleries fifteen years ago until now. The National Gallery of Ireland approved the relevant export licences to Sotheby’s. 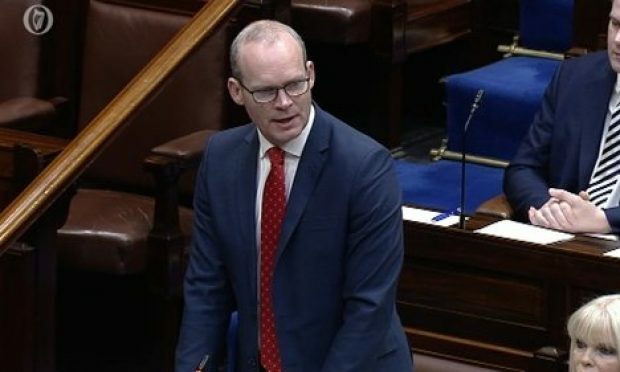 The owners would have been eligible for Irish tax relief in return for lending them. The paintings are part of the biggest auction of Irish art since the collapse of the Celtic Tiger, the Irish Sale at Sotheby’s, in London’s New Bond Street which has been reinstated after a long hiatus caused by the recession. Sotheby’s said “demand from collectors of Irish art from outside Ireland has increased”. 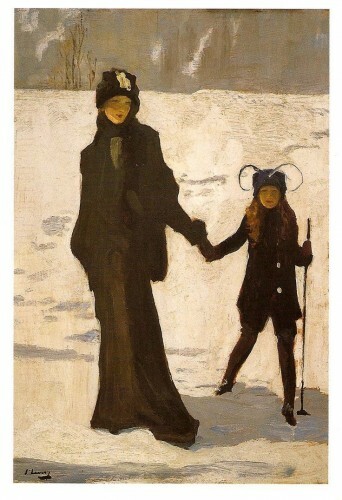 Japanese Winter, (left) by Sir John Lavery, depicts his wife Hazel, Lady Lavery and stepdaughter Alice, in the Swiss Alps in 1912, and has an estimated of £500,000. It was last bought at Sotheby’s in 1996 for £150,000 and has been on loan to the Hugh Lane Gallery in Dublin. The Talkers (1951) by Jack B Yeats, has an estimate of £250,000. It failed to sell at auction at Sotheby’s in 1998 for £150,000 and was bought privately afterwards and loaned to the Hugh Lane. 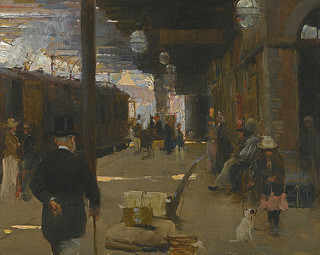 Hastings Railway Station (right) by Walter Frederick Osborne (circa 1890) was bought from a London gallery in 1997 and then loaned to the Hugh Lane. It has an estimate of £100,000. View from Howth, by Sir William Orpen (1912 ) was painted during the artist’s annual holiday at Howth Head and has an estimated price of £120,000. It was bought at Pyms Gallery in London in 1997 and loaned to the Hunt Museum in Limerick. Sotheby’s said that all four paintings, and others in the Irish Sale, will be returned briefly to Ireland for a pre-auction viewing exhibition at the RHA Gallery in Dublin for three days (8-10 October) before the 21 October auction. 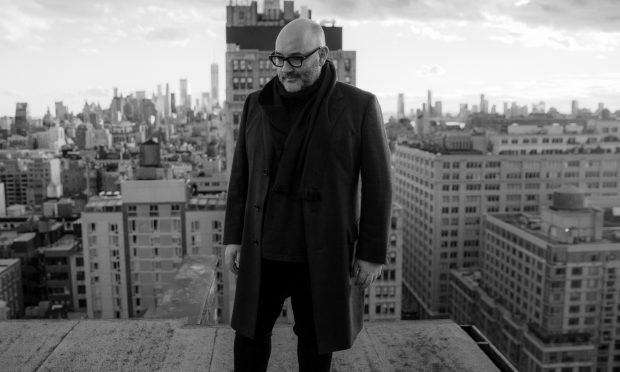 See more information on the Sotheby’s Website.